We install many types of epoxy floor systems in garages, mechanical rooms, basements, workshops, exercise rooms, bathrooms, and residential and commercial settings like shops and walkways. 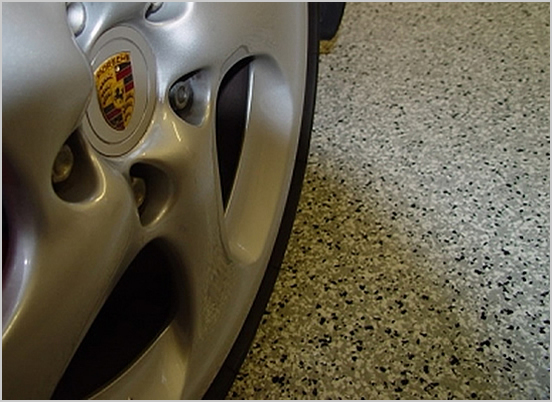 An epoxy coatings are easily cleaned, durable, chemical, and oil resistant floors. Adding an epoxy floor coating is an economical way to add value and a beautiful finished look to an otherwise boring looking un-finished concrete floor. We provide two types of epoxy floor a 100% solids system and a high solids system. We also install solid colored epoxy floor and decorative full broadcast chip floors. Our specialty is in the area of providing our clients with a reasonable, cost effective and very durable seamless epoxy floor to meet their needs. Our regular customers particularly value that we work with them to come up with a customized epoxy floor system for their particular needs whether it be a simple sealer to keep dust down and protect the concrete or decorative epoxy for a showroom like finish. 1) If required gaps, cracks, and imperfections are addressed by filling them with a fast set high strength epoxy filler or a Cement all product. Then these are areas are ground flush with the concrete surface. 2) Next the entire floor surface is mechanically ground using a walk behind floor grinder with diamond tooling. This industrial grinding machine is hooked to a dust extracting self cleaning vacuum to help minimize dust. We use different types of tooling depending on the type of floor and the surface prep that is required. 3) The concrete floor is cleaned and the epoxy is applied and the decorative color chips are broadcast into the wet epoxy to the point of rejection. 4) After the epoxy has sufficiently cured the access color chips are cleaned up and the floor is scraped smooth and broom cleaned. 5) The last step is the application of the clear protective topcoat. The total process takes 2-3 days. The floor can be driven on in seven days after the topcoat is applied and light foot traffic in 24 hours. Gordon Painting provides a five year warranty with all our floors.